These letter flashcards come in a big bold traditional manuscript with crisp clean lines. The uppercase and lowercase letters are on separate cards so you have options for how you can use them. Use as flashcards are meant to be used – to show to your students and have them tell you the name of the letter. They are big and bold enough to use whole classroom or with individual students. Great size to use in a pocket chart, too. 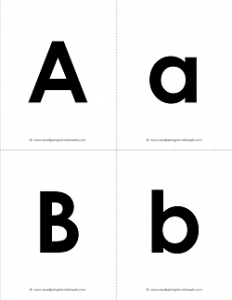 You can have your kids use them to play a matching game by matching the uppercase letters to the lowercase letters. Great review tool to use in centers. What other uses can you come up with? 13 pages with 52 flash cards. Go to this page to see all the alphabet flash cards sets on this site.